For all my years as a student of Sri Sathya Sai University, I have so much to be grateful for. I am indebted to Bhagavan Baba for this life, for so many humbling experiences one of which I wish to share with you all. This is indeed a rare experience that opened my eyes, a lesson of a lifetime in the form of an accidental meeting with one whom I love to call “The unknown hero”. After having received my Bachelor’s degree in Mathematics at Sri Sathya Sai University in 2004, I felt the need to continue my studies and opted to pursue my Master’s degree in Maths and Computer Science, the easiest way, I felt, to be with Bhagavan Baba for another couple of years. Five years didn’t seem to be enough at the Divine Feet of the Lord because of which I found yet another excuse to be in Prasanthi Nilayam. I spent yet another two years there to complete my Master of Technology in Computer Science in 2006. It was in my second year of M. Sc. that I had the good fortune of meeting a great person called Dashrath Manjhi. This unassuming person won my admiration with his 22 years of generosity and goodness. Dashrath is a daily wage labourer by profession who took pride in what he did for a living. He hails from a village called Gahlar nestled in the state of Bihar. The nearest town that had a reliable hospital was 80 kilometers away. Water and sanitation, let alone a decent school, was a huge problem in this village. In other words, a child in that village had hard time surviving. People with health problems found it burdensome to walk on a muddy road for 80 kilometers to get their first ray of hope in the form of a pill or the doctor’s advice. Some people even died on the way to the nearest hospital. Now, there was a short cut (relatively) across a hill to the nearest town. Well, the short cut wasn’t exactly an easy path to take, which meant that it didn’t really serve the purpose at all. Dashrath’s family was no exception to the inconvenience. The rough road caused many an injury to people traversing that distance through the hill. One day Dashrath’s wife fell down on that very path when she was on the way to meet Dashrath with his midday meal. It was at this point when Dashrath decided to build a tunnel through the hill to make life easier for his village folk. Obviously the whole village thought Dashrath had gone insane. How could he think that he could dig a tunnel through a huge hill? Some dream it was! We all claim to welcome new ideas, but this didn’t seem to go down too well with his people in the village. People laughed and dismissed it even before they heard him out. Dashrath remained unfazed and began his task of cutting through rocks in his attempt to build a tunnel. His children abandoned him calling him a madman. The new name caught on and the rest of the village called him the same. He earned his daily wages as a coolie, and then devoted a few hours everyday to this new challenge. It was in 1984 when he spelt out his dream and began to make it happen. 22 long years passed him by, but not without the realization of his dream – the tunnel that he had visualized in his mind. 25 feet in diameter and 1 kilometer long. Trucks could pass through the tunnel from the nearest town to Dashrath’s village and back. The village was blessed with a new lifeline. People from the village could reach the nearest hospital in 10 minutes. The road lay in front of him, his eyes shone with pride. It is another story that his wife wasn’t there, the reason for this noble gesture. But he felt peace in his heart as he knew an entire village benefited from this work of art. Didn’t Shah Jahan take 22 years to build the lovely Taj Mahal for his wife? Well, there’s a difference though. While Shah Jahan had the aid of 20000 labourers, all that Dashrath had was a chisel and a hammer. Such is the strength of the human spirit! It is easier said than done, but Dashrath did it! The then President revered Abdul Kalam honoured him with the Padmashree Award for this very selfless act. The government offered to give him a piece of land and a house. It was more of an embarrassment than honour for Dashrath Manjhi. He requested the government to build a hospital in the land given to him. What selflessness before our eyes. My friends and I were intrigued by his great act. We asked him a few questions as we couldn’t contain our curiosity. Q: What is your education qualification? Ans: Why do you need a qualification? Educated people only know four things: ka, kha, gha and ma. Dashrath Manjhi went to Prasanthi Nilayam to have Swami’s darshan along with a group from Hyderabad. We could see Swami talking to this hero when Dashrath pointed out his cap (visible in the photo) to Swami that had details of his name, the size of the tunnel he had dug single-handedly, and the time it took to complete this mammoth task. It’s time for us to dwell in a few minutes of introspection. If a coolie could do so much for his entire village, isn’t there something we can do? Something small but significant, if not any grand contribution? The choice is ours to define life beyond the four words: ka, kha, gha and ma. 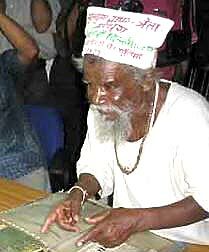 Dashrath Manjhi is no more, but lives in our midst in spirit. The article was written in honour of his meaningful life before his demise. To access all the previous stories of inspiration, please click here.